You nerds thought that last round was hard for us? This was harder. Lotta tough eliminations here. Some of these matchups most certainly went to Game 7. In the end, though, a victory is a victory. Behold: The ElEAT 8. Notes: I already explained why these two things are great; we know why they’re here. What I respect so much about these two pairs is that they don’t just work on their own or as a pair, they also perform when tossed into larger groups. Think about what chocolate & marshmallow do for the caramel in Ben & Jerry’s “Phish Food” or the salty almonds of Rocky Road. They don’t just bring up each other, they bring up the whole damn team. Likewise, Tomazzo work on their own and as a pair, but they are also the base of so many other delicious things (hello, all Italian food ever). Their potential is off the damn charts. Unfortunately, of the four chocolate pairings on this list, Chomallow is probably the weakest. Making it this far is no small feat, but there is no way it moves on from here, Tomazzo has too many tricks up its sleeve. Notes: For a moment, allow me to take off my food genius hat and put on my educator hat so I can teach you freaks a lesson for once. After World War II, everyone’s favorite of the horrible global wars, schools purchased cans of tomato soup to go with toasted cheese sandwiches in order to meet the government’s Vitamin C and protein dietary requirements. The meals were delicious, nutritious, and easy to make, especially for smaller schools where teachers were responsible for making food for students in addition to teaching (Side note: I am a teacher now and I can tell you that there is no way in hell I would ever make a meal for those rotten little turds. One time the cafeteria at my school flooded during a storm and I had to bring bags of emergency food to classrooms full of hungry students. It was an absolute nightmare. A whole meal? I’d sooner die.) The Grilled Cheese & Tomato Soup combo remains an American classic despite no longer being a federal requirement because of the way the flavors and textures work so well with each other, and its general inexpensiveness. 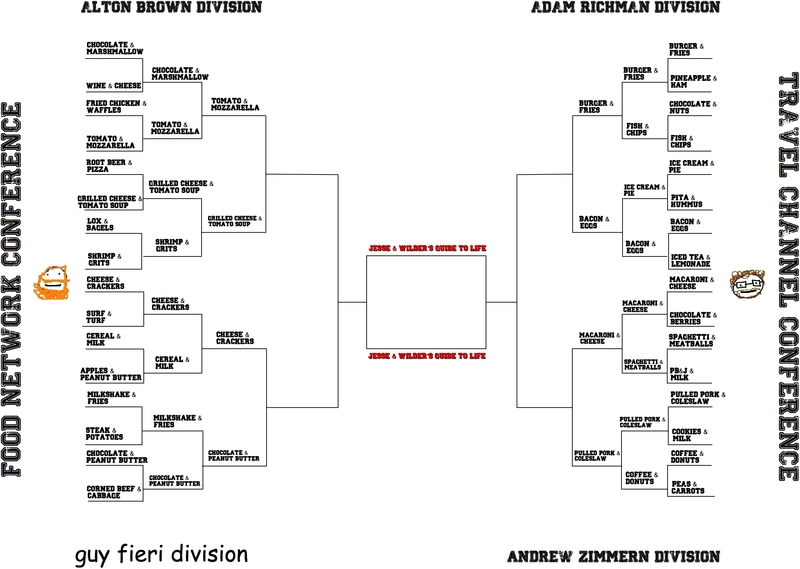 I tell you this because my most controversial pick of round one was eliminating Lox & Bagels in favor of Shrimp & Grits. All of the haters and the losers came out of the woodwork to tell me that in their hypothetical nonsense food bracket, they were right and I was wrong. Guess what, bing bongs? It doesn’t matter. I love Shrits (this one maybe doesn’t work great) as much as anyone, but GC&TS is basically the Captain America of food pairings, and was always destined to move on; If you don’t like it, take it up with Uncle Sam. Notes: I have done a lot of soul searching in my pursuit of giving the perfect answer to this match up, and I have to tell you: there isn’t one. It’s too hard. There are no winners here. But, at any rate, let’s review. There is a certain feeling that a grown man-baby like myself gets when sitting down with a bowl of Apple Jacks or Cinnamon Toast Crunch. It’s a safe and warm feeling, like a grandmother’s embrace. And it goes without saying that putting Milk & Cereal together greatly improves both of these things. They need each other. On their own they are fine, together they are truly wonderful. With all of that being said, I didn’t realize how much I loved Cheese & Crackers until I was forced to choose against it. They can be whatever you need them to be, and are perfect for any occasion. If it is a black tie gala with fancy guys and gals prancing about in their formal wear, it is a good time for Cheese & Crackers. If it is 1:30 in the morning and I am blackout drunk in a stranger’s home, it is also a good time for Cheese & Crackers. They have no ceiling or limits. The same cannot be said for Milk & Cereal. There are seemingly infinite numbers of combinations one can make with all of the different types of cheeses and all the of the different types of crackers, and every single combination is special and great in their own way. Cereal & Milk, as delightful as they are, have nothing left to show me; I have seen the top of that mountain, and it is great, but great will simply not cut it here. My heart will always be with Milk & Cereal, but if we are talking about the best versions of things, there is no way in hell that the best Cereal & Milk is better than the best Cheese & Crackers. Notes: I’m sorry Milkshake & Fries. Your upset in round one over the highly overrated Steak & Potatoes was a shock to everyone, and lord knows I love a good underdog story, but there is something much bigger than you brewing here. When people look at this bracket there are a few choices–Burger & Fries, Milk & Cereal, Bacon & Eggs–that jump out as clear favorites to win the whole thing. They are, you might say, the classics. Well I recently talked to Chocolate & Peanut Butter (we text from time to time), and they are feeling incredibly disrespected. Of all the buzz around this bracket (and believe me, there is considerable buzz) nobody is talking up Chocobutter. Well, as it stands, Chocolate & Peanut Butter is the last of the four chocolate pairs in this bracket remaining, and has advanced two rounds in a row without any type of resistance. It’s time to start paying attention. Notes: Interesting matchup right here. Grilled meat and fried potatoes versus fried fish and fried potatoes. What intrigues me about this is that fries are the secondary character here — a side dish. It puts the weight of this whole match on the fries themselves, and forces me to ask myself: which protein do fries compliment more? A piece of grilled beef, or a piece of fried fish? Furthermore, there’s another factor at play here: the type of fry. Generally, the “chips” with fish are big fat fatties. Burgers are more commonly seen with skinny fries (but certainly not always — I’d put it at 70/30). So which fried tater compliments their counterpart better? When you take a bite of a burger, do you NEED fries? When you take a bite of a piece of fried fish do you NEED chips? Conversely — when you take a bite of a fry, what do you crave more? A burger or fish? Fish & Chips, as a dish, contains two things that are fried, hot, and crunchy. This could play as both a success and a flaw. Personally, I like some nice cold slaw with fried fish just as much as I like the chips. If you serve me a plate of fish, chips, and coleslaw, I’d most likely follow up my first bite with the slaw. A different temperature and consistency. If you serve me a plate of a burger, fries, and coleslaw (or any other salad), there is simply no way in hell I’m reaching for anything first besides those golden brown beauties. The answer is Burger & Fries. It’s always been Burger & Fries. Notes: Another toughie. This was a Game-7-Triple-Overtime kind of matchup. Both of these pairings really bring out the best in each other. Two foods coming together to create something beautiful and harmonious. There’s something to consider here, though: ice cream. Let’s talk about ice cream. If you aren’t familiar with ice cream, A) get out of here, B) read a book, C) go back to wherever you came from, D) you’re adopted, and E) give up on everything you care about because you’re a lost cause. Ice cream is a wonderful, delicious treat sent from heaven above designed to cool you down on a hot day, cheer you up in literally any circumstance, or just generally improve your mental health. It is scientifically impossible to be sad when you’re holding an ice cream cone. Because of this, though, ice cream is fine on its own. Of course a scoop of vanilla ice cream will make a piece of cinnamon apple pie soar. Most baked fruit pie (or cobbler) definitely makes you yearn for ice cream. Ice cream, however, is much less dependent. I imagine there have been many times in your life when you’ve strolled down the avenue with a delicious ice cream cone in your hand, not at all wishing you also had a huge slice of pie. Bacon & Eggs, on the contrary, are completely tied to each other. They are a true team, a dynamic duo, a beautiful convergence of light from beyond worlds. Notes: This matchup was much easier for me than the either of their previous opponents. Both faced pretty equal competitors before, but when I look at them against each other, I gotta go with Mac & Cheese. People eat meatballs as an entree all the time: BBQ meatballs, even Italian meatballs. People eat spaghetti in a number of ways as well, and not always with meatballs. I’ll tell you this right now: I like spaghetti carbonara better than spaghetti & meatballs. Both spaghetti and meatballs are very versatile players. They’re like Westbrook and KD: big stars that don’t particularly need each other. Would you even consider eating macaroni without cheese? Just plain macaroni? Even a lot of macaroni salad has cheese in it. And I think we can agree, of all the classic cookout side dishes — coleslaw, potato salad, macaroni salad, and pasta salad — macaroni salad is probably the worst. As they say in Italy: Spaghetti and ASSPPIIICYYYY MEEEATAAABALLLS aren’t as good as Mac ‘N Cheese! Notes: I keep telling myself: this bracket is not about me. This bracket is not about me. If it was about me, it would have been pulled Pulled Pork & Coleslaw in a heartbeat. But there’s more to it than that. It’s about true pairs, a team to beat other teams. I have to consider what a duo Coffee & Donuts are. An extremely formidable opponent. Do they have what it takes, though? Keep in mind, in the first round I eliminated Cookies & Milk in what has been certainly the biggest upset of the tournament (I’ve received numerous death threats about said elimination). To say Coffee & Donuts are better than Pork ‘n Slaw is to say Coffee & Donuts are better than Cookies & Milk… which they are not. I’m gonna invoke the Higher Ceiling Argument again — Coffee & Donuts can only be so good. At best, coffee is excellent and donuts are excellent but when they get that good they don’t really need each other. In fact, the better they are, the less they need each other, and that is not the mark of a strong pair. Donuts have taken off in a huge way. Some places are doing outstanding things with savory flavors like maple/bacon and even fried chicken. Is a cup of coffee what you wanna wash down a maple bacon donut with? I don’t think it is. Now let’s turn that argument back on Pork & Slaw. The more chef-driven and tasty the Pulled Pork & Coleslaw, the more I still seem them benefiting each other. Bourbon-root beer glazed pulled pork with green apple slaw? Yes. Hell yes. Give me that. Sure, this isn’t about me — but when I look outside myself, heavenward, towards true meaning and perfect balance between food pairings, I have no choice but to hand it to Pulled Pork & Coleslaw once again.